All Outlook.com users benefit from spam and malware filtering. For Office 365 Home and Office 365 Personal subscribers, Outlook.com performs extra screening of the attachments and links in messages you receive. When you receive messages with attachments, Outlook.com scans the attachments for viruses and malware using advanced detection techniques that provide a higher level of protection than the free version of Outlook.com. If Outlook.com detects a dangerous file, it will be removed so you don’t accidentally open it. 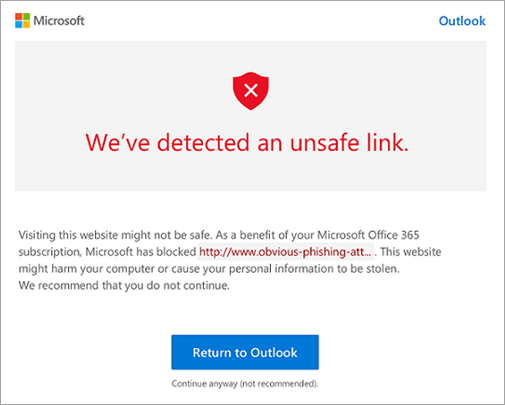 When you receive messages with links to web pages, Outlook.com checks whether the links are related to phishing scams or are likely to download viruses or malware onto your computer. If you click a link that is suspicious, you will be redirected to a warning page like the one below. We don't recommend clicking through to any web pages that trigger the appearance of the warning page. The protection is automatic. These premium security features activate automatically for Office 365 Home and Office 365 Personal subscribers who have email accounts ending in @outlook.com, @hotmail.com, @live.com, and @msn.com. These security features work regardless of how you access your Outlook.com email. Outlook.com implements these security features in the cloud, so you will be protected whether you're accessing your Outlook.com email on the web, your phone, the Mail app on Windows 10, or any other email client. The protection applies to Outlook.com mailboxes only. These advanced security features do not apply to third-party email accounts such as Gmail and Yahoo Mail that are synced to an Outlook.com account. ﻿I access my Gmail account through the connected accounts feature in Outlook.com. Will the advanced security features work for me? ﻿No. Third-party email accounts such as Gmail and Yahoo Mail are not covered by the advanced security features. I access my Gmail account using the Outlook app for iOS or Android, Mail for Windows 10, or Outlook 2016 for PC or Mac. Will the advanced security features work for me? No. Third-party email accounts such as Gmail and Yahoo Mail are not covered by the advanced security features. Can I share the security features with others as part of my Office 365 Home subscription? Yes. With an Office 365 Home subscription, you can share the benefits with up to 4 others. If the people you've shared with have Outlook.com mailboxes, they’ll get the benefits automatically. Learn about sharing Office 365 Home subscription benefits. Can I turn off Safelinks? To provide the best protection for your account, Safelinks are on by default. You can turn them off by signing in to https://outlook.live.com. Then select Settings > Premium > Security. There's a toggle under Advanced Security that you can use to turn off Safelinks. Note that turning off Safelinks will only affect future messages you receive. It won't change the link format in messages you've already received.